It’s no secret by now that health and wellness play a significant role in the way I lead my life. With a background in dance and my most recent undertaking of teaching Cardio Jump at Victoria Park gym (Fridays at 11:45AM…come workout with me! ), staying active and fit has always taken precedence throughout the years. When it comes to food and beverage, I am always looking to eat clean and intake the most amount of nutrients without compromising on taste. With juice and salad bars opening up left right and center, maintaining a healthy lifestyle has never been so easy! 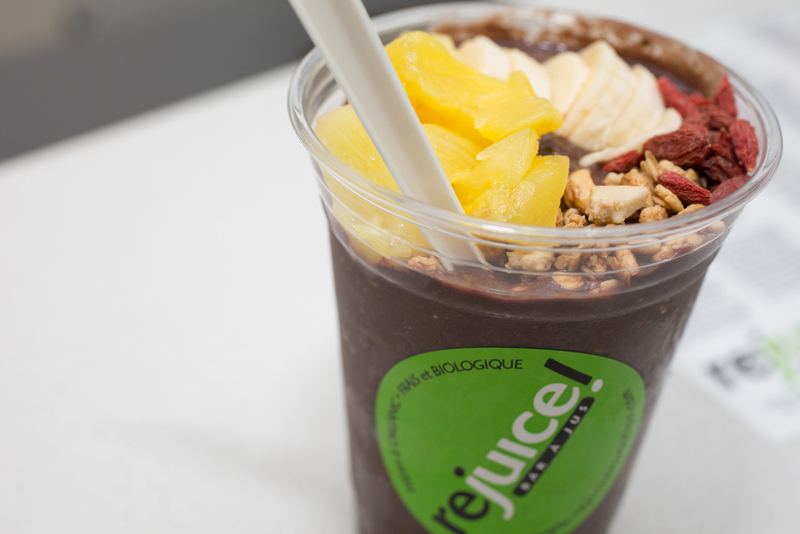 Leading the health craze in Montreal is Rejuice Nutrition, an organic juice bar with locations in TMR and Westmount. Joanna Barcessat, a former personal trainer, spinning, and fitness instructor, opened Rejuice in 2011. A true health junkie like myself, her passion for working out led to the study of Naturopathy where her interest in juicing was born along with the idea to found her own one-stop health shop. They serve everything from cold and fresh-pressed juices, smoothies, salads, as well as my personal favorite, 3-5 days cleanses. The benefits of juicing and juice cleanses are infinite and I thought I would break it down for those who are new to the trend. Juices provide our bodies with the essential vitamins, nutrients and enzymes, moreso when organic vegetables are used. The advantages are improved immune systems and boosting recovery time from illnesses, accelerating metabolism, weight loss, relief from symptoms of depression, slowing the effects of aging, and much more. Cold pressed juices contain 5 times more enzymes, vitamins and minerals than other processes making them the most nutritious option, with a 72 hour shelf life as opposed to fresh-pressed juices that are meant to be consumed immediately. The Rejuice cleansing program consists of six fresh pressed juices and smoothies for each day. Depending on your health goals, you can opt for a 3 to 5 day cleanse. The menu consists of two smoothies in the morning followed by 3 cold-pressed juices throughout the day. Staying hydrated is key and raw veggies are permitted when hunger pains strike. It’s important that once you complete the cleanse, that you continue to eat clean to maximize benefits. As a mom of two girls under 5, I’m exposed to every type of illness that is commonly spread in daycare and school. I’ll often do cleanses to boost my immune system or to help speed up recovery time when I get sick. After trying the Rejuice 3-day cleanse, I felt rejuvenated and recharged. I attribute incorporating green and fresh juices in my daily routine to maintaining health and energy levels in combination with all my other efforts. Do you even juice?